Recently, the Graduate Management Admissions Council (the authors of the GMAT exam) announced that a new section would appear on the GMAT in 2012. This section, Integrated Reasoning, is currently under development by the GMAC. However, for the time being, the GMAT exam in 2011 will retain the same format it has had since it switched to a Computer Adaptive Test in 1997. That being said, students who take the GMAT in 2011 should be aware of some broad trends. First of all, the median GMAT score has been trending upwards in the past five years; currently, the median GMAT score is 540. 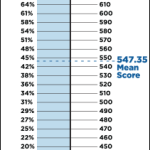 Interestingly, this upward trend has been observable since 2005; in the previous five years, the median GMAT score remained steady at 520. I can think of two possible explanations for this trend. First, 2005 was the year that Pearson VUE took over administration of the GMAT exam from ETS. This switch may have caused GMAT scores to reset to a higher baseline. Secondly, a number of excellent new test prep companies have gained popularity since 2005. Along with new GMAT test prep materials, additional GMAT study options have become available. In particular, online GMAT test prep and online GMAT tutoring has become more accepted. The wealth of high-quality test prep materials and greater access to skilled GMAT instructors may be contributing to the rise in GMAT scores. Another trend is the rising number of non-US citizens taking the GMAT exam. 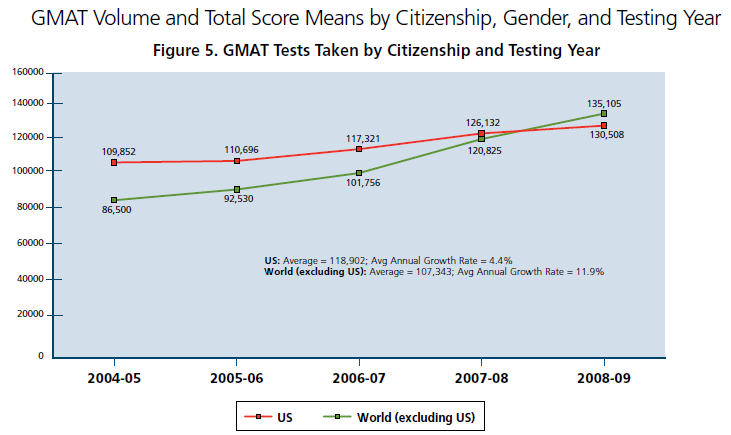 In 2009, the majority of examinees sitting for the GMAT exam were non-US citizens. Although US-based programs are still the preferred destination for most MBA applicants, business schools applications in other countries have been growing astronomically. Since 2005, MBA applications have more than doubled for schools located in India, Singapore, and Spain. Although US schools are losing “market share”, the absolute number of applicants is still rising due to the rise in the overall level of GMAT examinees. In 2009, 263,000 examinees took the GMAT, compared to 200,000 in 2005. This represents a CAGR (compound annual growth rate) of about 7%. At this rate, the GMAT 2011 will have just over 300,000 examinees. However, it should be noted that historically, the number of GMAT examinees increases most rapidly during economic recessions. This seems to be true in the latest economic cycle. In 2006 GMAT test-takers only increased by 4,000, while in 2008 and 2009 GMAT examinees increased by more than 20,000 each year. One ratio appears to be holding constant. Since 2000, the ratio of male to female examinees on the GMAT exam had held steady at 60/40. Since this ratio has held steady for the past ten years, it is likely that it will be roughly the same for the GMAT 2011. Overall, since the new section of the GMAT exam won’t be added until 2012, current test prep materials remain valid. Students certainly should not delay taking the exam until 2012 because of the new section. The right time to take the exam is when you can devote 2-3 months to studying, while leaving yourself with ample time for application essays and recommendations.